Having picked up my new to me 2016 Tuono Factory today and loving every freezing cold mile on it!, I was wondering if anyone has fitted a Ventura system to theirs as their website does not list the factory as a model supported. Maybe the 2016 RR will fit? Ventura are unsure. A group of us are planning a trip to the Black Forest later in the year so any luggage suggestions would be greatly appreciated. I spoke to them yesterday and they said there was an order from a guy taking his Factory to Italy! They recommended the mount and a tail pack part no. 640811, are you going for this too? Cheers Bigrog for an excellent write up, your setup looks a lot neater than the Ventura system. 2016 Tuono V4 1100 Factory for sale. 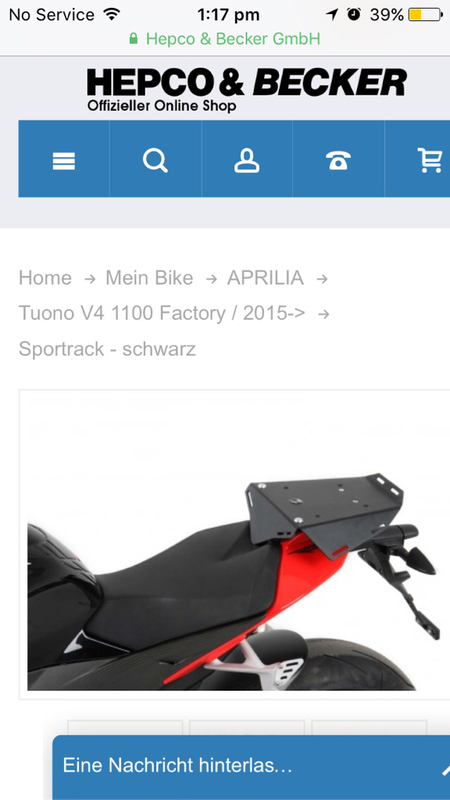 Ventura luggage system forTuono Factory 2015 ?